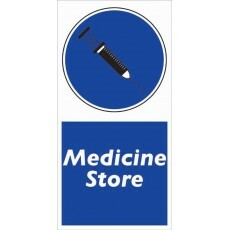 Medicine Store Sign to be erected outside of your medicine store which should store injections, dosing fluid, sprays for cattle/sheep and equipment. This store should also be locked. Suitable for cross compliance audit purposes. 1ft x 1ft corry board. These signs are suitable for outdoor use they are strong, durable and weather resistant.